Product prices and availability are accurate as of 2019-04-18 13:27:26 UTC and are subject to change. Any price and availability information displayed on http://www.amazon.com/ at the time of purchase will apply to the purchase of this product. Author Bookstand is proud to offer Peach's Passion for Fashion by Bookstand Publishing. Peach's Passion for Fashion has generated a lot of interest and excitement and we think it would be an excellent addition to your library. 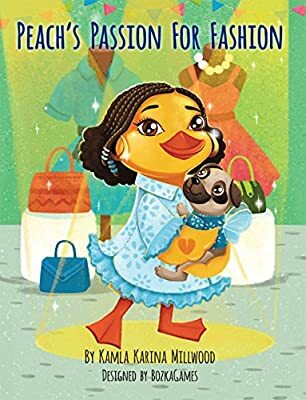 Peach's Passion for Fashion is Vincentian-born Kamla Karina Millwood's fifth book in the Peach The Duck series. In this book, the beloved character Peach The Duck shares her passion for fashion and love of dressing up with her pet pug named Paulo. Those who love animals and rhymes will absolutely be floored with this new book. Kamla gets into the mind of animal lovers (as she is one herself) and depicts her vision ever so beautifully in Peach's Passion for Fashion. Our Cat Hogan - Could He Be Part Dog? I've Lost My Special Power!